Did you know STRESSED spelled backwards is DESSERTS? It totally makes sense doesn't it? Sometimes when we have a lot going on in our lives, whether it's with work, your family, school or anything else, we need to just stop, relax and eat a cupcake! Baking is a stress reliever for me. 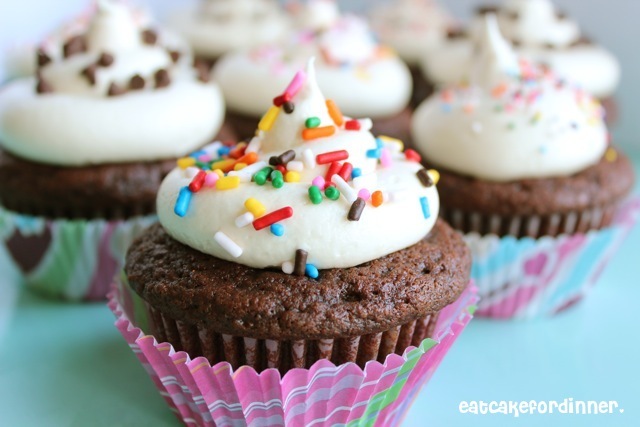 I went back and forth and back and forth so many times with which type of frosting I wanting to make to go on top of these chocolate cupcakes. I was originally going to do a chocolate and vanilla swirled frosting, like Ashton. Then, I wanted to do a Nutella frosting, but everyone seemed to be making Nutella frosting lately. So, I thought maybe a coconut frosting would work, since I was just given a bottle of Coconut Bakery Emulsion. I love chocolate and coconut together (like Almond Joy). I was all set . . . until . . .
. . . I came across this picture on Pinterest. Oh my! That frosting was calling my name! Apparently it was calling my name back in 2011 too, because I had already left a comment almost a year ago saying the exact same thing I was thinking right now! These cupcakes turned out so good! 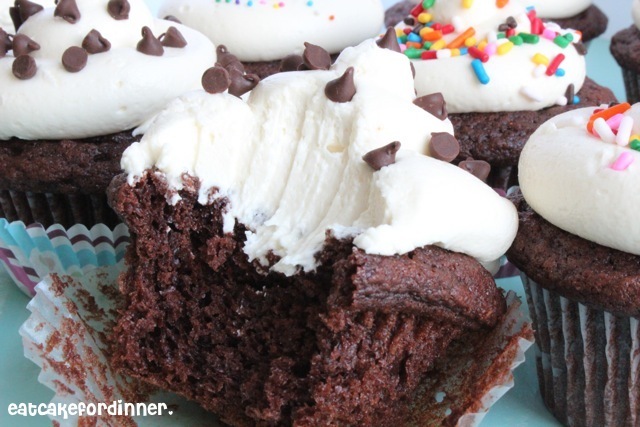 The chocolately cupcake paired with the thick and creamy marshmallow frosting is enough to make you forget all your worries for a few minutes while you savor each and every bite. My favorite were the ones with the mini chocolate chips on top. Preheat oven to 350 degrees. Line muffin tin(s) with 24 paper liners. Combine the cake mix, pudding mix, sour cream, oil, eggs, chocolate milk and vanilla and mix well. Stir in the chocolate chips. Batter will be thick. Divide batter between muffin tin(s). Bake 20-25 minutes (mine were done at 20 minutes) or until a toothpick comes out clean. Cool completely and frost. Cream together butter and marshmallow creme until light and fluffy. Add the powdered sugar, one cup at a time, beating until combined. Add the salt and vanilla and beat until light and fluffy. If the frosting is too thick, add a little milk or whipping cream. Mine did not need any extra liquid, it was perfect. Jenn's Notes: I didn't add the chocolate chips to the cupcakes, but I do think it would be really good and extra chocolatey with them. I only made a half batch of the cupcakes and I ended up using almost all the frosting since I added a huge swirl to each one. So, if you are also going to do a huge swirl on top I would recommend making extra frosting. These are so pretty! I am going to totally have to make your frosting sometime- soon!! Oh my gosh! I've never had marshmallow frosting, and apparently I am really missing out! I have to make these! I like that you used yogurt instead of sour cream in the cake. Looks like the perfect stress releaser for me! I must try your frosting. I've never added marshmallow creme. It has to be wonderful. THis is like another fun spin on smores...or what doesn't go well with chocolate! Ohhh my. 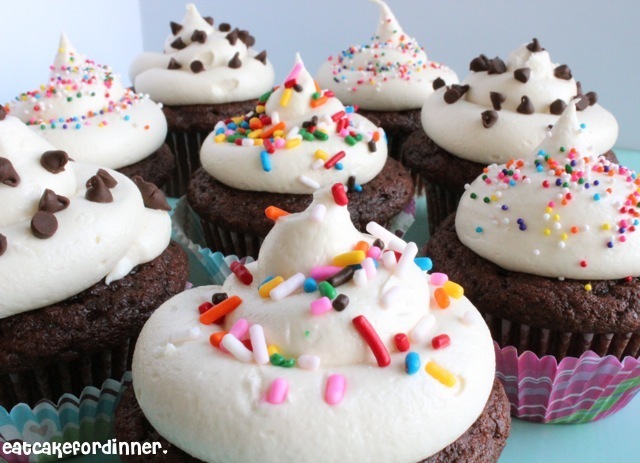 I could possibly live on that frosting! Pinned the recipe and can't wait to try it! I am a follower of your blog on Facebook and would love if you could hop over to my blog (http://sarahsaturdiy.blogspot.com/) and share the blog love. Have a happy Monday! Can we use this cake recipe and put it in a cake pan to make a cake ?